The company already has a vehicle tracking system but has installed the SureCam devices in more than 100 commercial vehicles to get added insight into any driver incidents. The SureCam connected vehicle cameras will provide immediate access to HD video of any road collision, near miss or harsh driving event. 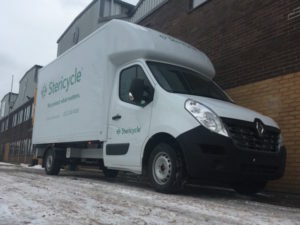 In addition, a league table will rank the best and worst performing drivers as part of Stericycle’s targeted training programme. Stericycle will also use the connected camera footage to support its claims management process, allowing an early decision on whether to settle or defend a claim. Where required, repairs and hire arrangements will be immediately organised, so the claims lifecycle costs can be kept to a minimum. “We wanted to take a structured approach to ensure we are best placed to defend claims or quickly respond where a claim needs to be settled. Working closely with our external partners Sopp+Sopp and Plexus Law, we will use the connected cameras to take advantage of First Notification of Loss and have better control over our claims management process,” said Lee Jackson, group head of fleet at Stericycle.